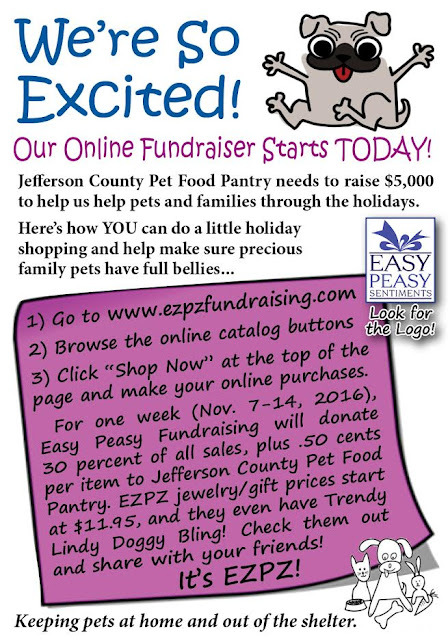 Jefferson County Pet Food Pantry : EZPZ Jewelry & Gifts Online Fundraiser Nov. 7th -14th!! EZPZ Jewelry & Gifts Online Fundraiser Nov. 7th -14th!! If you can't get to the Pantry to donate or buy some of our thrift store items, here's a way to support us. There are lots of fabulous jewelry pieces and gifts that would make great holiday presents. AND they even come gift wrapped! Thirty percent of the proceeds from your purchase will be donated to the Pantry.